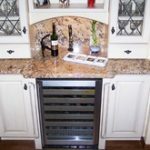 Apart from kitchen and bathroom projects, American Stone Edge also installs entryways, bars, hearths, mantles, footpaths, and BBQ slabs. 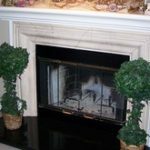 Every part of your home can benefit from the added elegance of a natural stone feature whether it’s a marble hearth in your living room or a granite footpath in your foyer. 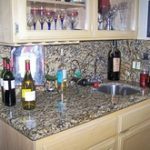 Apart from residential stonework we commonly do specialty jobs for restaurants, bars, offices, and retail stores. Quartz is a popular choice for commercial clients who want to improve their interior decor with a professional, permanent countertop. It is an excellent selection for any surface that will undergo heavy wear because it is highly resistant to stains, chips, and cracks. Quartz is great for food preparation because it does not scratch when used to dice vegetables or hold pots and pans. Travertine can serve nearly any purpose as it is highly versatile and matches well with wood or granite. We frequently install travertine wall cladding, bathroom floors, countertops, and showers. Onyx is a beautiful but fragile addition to any room. 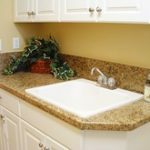 It is easily scratched and can be discolored by stains so it is scarcely used for countertops. It is commonly used for decorative purposes because it evokes a warm, mesmerizing sensation when installed with a backlight.